It may be ‘hometown date’ week on Everlasting, but none of the remaining men seem any closer to winning Serena’s heart as we inch toward a final rose (or key, or whatever). In the control room, the producers battle it out for each of their guys to get that special hometown date — Serena is technically making that choice, but they all know that with Quinn’s go-ahead they’d have no problem getting her to choose their guy. Everyone makes their case: Rachel votes Owen (Fireman! Veteran! Family man! ), Madison pushes for Zach (He’s viral! Millennials love him!) and Jay wants Jasper (She’s almost forgiven him! The U.K. isn’t boring!). 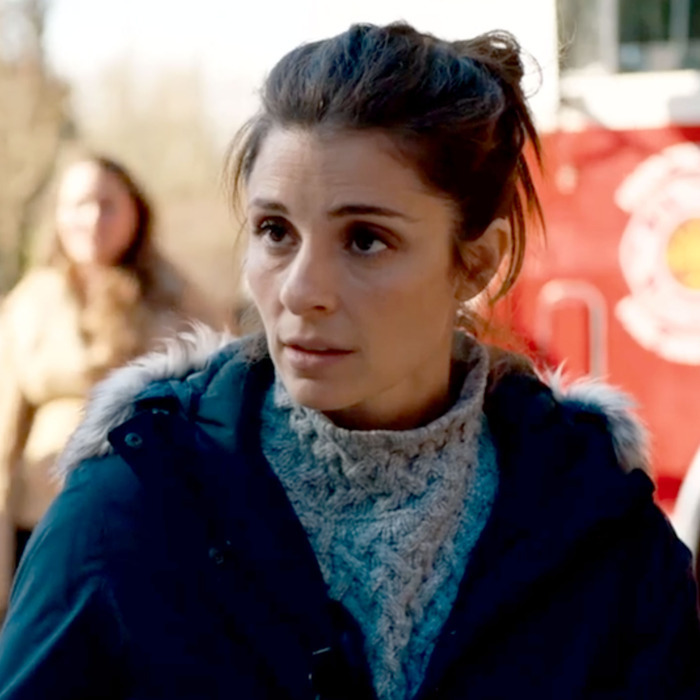 Quinn asks Fiona, her old TV pal whom she’s invited on set for the day, what she thinks: “I say you go fireman. Silicon Valley powerhouse gives it all up to become a mom with a veteran from Small Town, USA. Healing a divided nation or the death of feminism — both very hot right now.” Sure, she goes for Rachel’s guy, but not with Rachel’s narrative: “This would be making a family for a young girl who’s never had a mother …” she argues. It doesn’t matter. Quinn goes Owen and Rachel makes it happen. And so, the Everlasting crew sets off for Owen’s hometown of Frontier Creek, Colorado. But not before a dramatic selection (taped for air, of course) has Serena making her choice as a completely shocked Owen … asks them to cut and then leaves the set. He tells Serena he doesn’t want her to visit his hometown or meet his daughter because of her “choices” — for example, the whole “bet” thing. Why, he asks her, is Jasper even still here? “If you’re really okay with that, I don’t think you’re the kind of person I want to take home to my daughter.” Harsh, but it’s a weird freak-out considering he’s known all along that he has a kid at home, and that Serena might eventually have to meet her. It’s been quite obvious that Owen is the “nice guy,” slow-cooking option for Serena — that he’d eventually have his story line (yes, both on Everlasting and on UnREAL), his chance, maybe even his downfall. She says to him: “You are the only truly good man here. I’m just sorry I didn’t realize it til now.” That does it and he caves. So who’s going to Colorado? Well, Rachel — Owen is her “guy” after all. And Jeremy, who can’t seem to leave her alone. After everything they’ve been through! Even though he’s hooking up with his camera-holding co-worker! He asks Dr. Simon how Rachel’s doing and Dr. Simon is (smartly!) like, Can you leave her alone? In response to that, he tells his hookup that she’ll be staying on set at Everlasting while he jets off to Colorado. Without her. Also staying on set? Jay (whose erratic behavior no one seems to notice), Quinn (for now, at least), and Chet. Speaking of Chet, he asks Quinn for a big favor: Will she testify in a hearing so that he might get partial custody of his son? She agrees, after he tells her that she’s his only hope (according to his lawyer). Back in Frontier Creek, Owen’s daughter Riley greets Serena with, “You’re my new mommy!! !” and she (understandably?) freaks out. Maybe I’m as weird as Serena is, but that’s a peculiar way to greet a stranger — even for a 6 year old. Owen (and the cameras) watch this entire thing go down, and Rachel realizes that maybe this perfect-family narrative isn’t meant to be. Maybe Serena’s maternal instincts aren’t going to kick in and, instead, she’ll just end up further traumatizing this poor motherless child. As someone who also feels like she didn’t have a mother growing up, Rachel doesn’t want that for Riley and calls Quinn to try and nix the whole thing. Instead of agreeing with her, Quinn just shows up in Colorado. She can tell when Rachel isn’t on her game. Quinn shows up with her own plans, and just as Serena is about to mercifully cut Owen (and, by extension, his daughter) … a clown shows up out of nowhere? Normally, not the weirdest surprise, but Quinn knows that Riley is deathly afraid of clowns. Serena and Owen run out to see why Riley is screaming and yep, it’s a terrifying clown. Freaked out, Riley darts for the road and Serena, with a sudden burst of adrenaline (and maybe some of that maternal instinct?) runs out after her and pushes her out of the way of oncoming traffic. How Quinn knew this chain of events would push Serena into motherhood, we’ll never know, but she has successfully twisted the game once again. But it’s weird, putting that kid in actual danger to push a narrative. Even Chet thinks she crossed the line. “Suddenly there’s a line?” she asks him. ‘If you were a mother, you’d understand,” he snaps back. (As we learned last season, that’s not an option for her.) Bad idea: She tells him she’s not going to give that testimony he so badly needs to see his son again. Cut to: Chet in a prop truck smoking out of a big bong. He’ll get a call from Gary asking for his help in taking Quinn down (in exchange for that awards-show glory he’s desperately seeking), and this time he might just help. In case you were wondering what the other dudes were up to while most of the crew was in Colorado, well, they were digging holes. Holes that started as infiltration pits for the environment (thanks August!) but turned into a shirtless, hard-body hole-digging contest. August, Jasper, and Zach all participate in the thirsty dig-off, and August wins — all caught on tape thanks to Madison. At the elimination ceremony, she’ll save Owen, Jasper, Alexi, and August. Zach, the social-media phenom, will have to go. But not before calling the rest of them douches, which, fair. And after hours of trying to save one family, Rachel will learn that she also won’t be able to save her own. Dr. Simon gets a call that Rachel’s dad called her mom and had himself checked out of the rehab facility.